The International Mental Health Research Organization won this round as Mounukhion 2014 cause for Pandora's Kharis, with 64 percent of the votes! The organization is committed to raising awareness and funding neuropsychiatric research to find preventions and cures for severe mental illnesses, focusing on schizophrenia, bipolar disorder, and major depressive disorder, within a generation. 100 percent of the money that is donated to them is dedicated to research. The PayPal account is open to receiving your donations to this beautiful and worthy cause! The deadline for donations is May 1, and I thank you in advance already for them. All PayPal costs will be covered by Elaion so your full donation will be transferred to the International Mental Health Research Organization. Let's make this one count! The International Mental Health Research Organization (IMHRO) is committed to raising awareness and funding neuropsychiatric research to find preventions and cures for severe mental illnesses, focusing on schizophrenia, bipolar disorder, and major depressive disorder, within a generation. 100 percent of the money that is donated to them is dedicated to research. The Donkey Sanctuary was founded in 1969 by Dr Elisabeth Svendsen MBE and supports projects in 27 countries worldwide. It reaches out to those in greatest need through the provision of permanent refuge and veterinary services to alleviate their suffering. Over 50 million donkeys and mules exist in the world. Many need care and protection from a life of suffering and neglect, whilst others have a vital role to play in human survival and happiness; they are at the heart of everything they do at The Donkey Sanctuary. Do you have a favourite out of these five? Vote for your favourite in our poll. If you would like to donate to any of these, or have other causes to pitch for next month? Come join us as well! We will announce this month's winner on April 20, 2014. 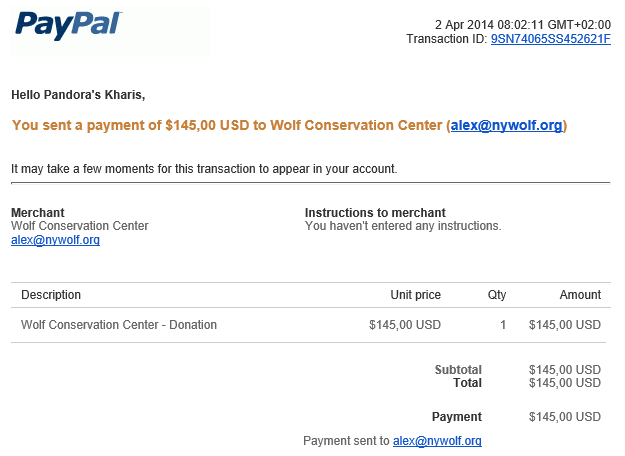 Elaion is proud to announce that the sixth Pandora's Kharis donation run has raised $145,- for our democratically decided upon cause, the Wolf Conservation Center. I am once more very happy to say you have all given generously, and in the spirit of the Gods. The Wolf Conservation Center (WCC), founded in 1999 by Hélène Grimaud, is a private, not-for-profit environmental education organization located in South Salem, NY. The WCC’s mission is to promote wolf conservation by teaching about wolves, their relationship to the environment, and the human role in protecting their future. The WCC accomplishes this mission through onsite and offsite education programs emphasizing wolf biology, the ecological benefits of wolves and other large predators, and the current status of wolf recovery in the United States. The average amount paid by the contributors was around $20,-, with donations coming in as high as $50,-. The $10,- fee taken by PayPal was covered by Elaion, of course, so every cent donated has gone to the center. As always, I would like to ask members of Pandora's Kharis who have donated or otherwise aided in any way to dedicate their gift of money or time to the Gods, especially Apollon Lykeios, who is particularly associated with wolves. From this moment on, the Pandora's Kharis Facebook page is open to pitches. If you do not have Facebook, feel free to pitch your cause in the comments. We will relay the message to the community. On to another month of pitching, voting, and giving. Thank you for your generosity!